In a bowl, combine pork, soy sauce, and Chinese cooking wine. Stir until pork is coated and marinate for about 30 minutes. Drain well. In a bowl, combine flour, cornstarch, and salt, and pepper to taste. Dredge pork in flour mixture to fully coat. In a pan over medium heat, heat about 2 inches deep of oil. Add pork cubes and cook, turning as needed, for about 6 to 10 minutes or until golden, crisp and cooked through. With a slotted spoon, remove pork from pan and drain on paper towels. Do not overcrowd pan during frying, cook in batches as necessary. In a pan over medium heat, heat about 1 tablespoon oil. Add onions and bell peppers and cook, stirring regularly, for about 1 minute or until half done. Remove from pan and drain on paper towels. In the pan, add sweet and sour sauce mixture, whisking regularly, and bring to a boil. Continue to cook, whisking regularly, for about 2 to 3 minutes or until thickened. Add onions, bell peppers, and pineapple chunks. Cook for about 1 to 2 minutes or until tender yet crisp. Add fried pork and continue to cook, tossing to coat with sauce, for about 2 to 3 minutes or until heated through. Serve hot. Alternatively, pan-fry the bell peppers, onions, and pineapple chunks until tender yet crisp. 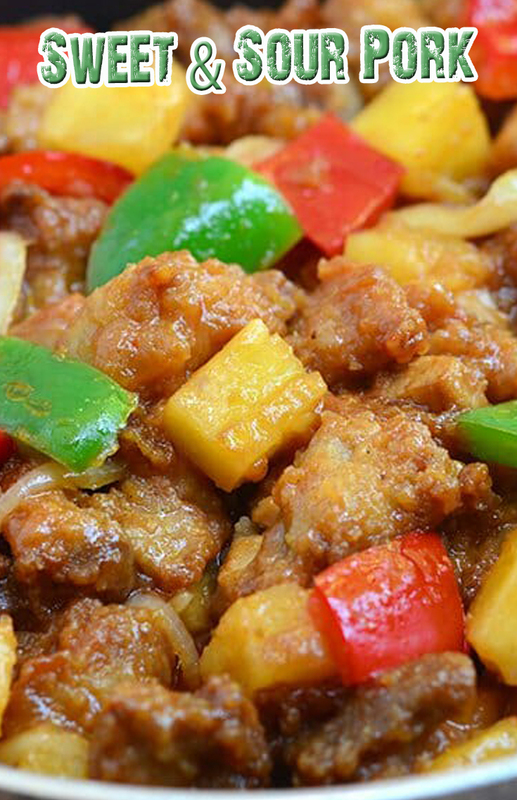 Arrange fried pork cubes on a platter and garnish with the sauteed bell peppers, onions and pineapple chunks. Drizzle with the prepared sweet and sour sauce just before serving.